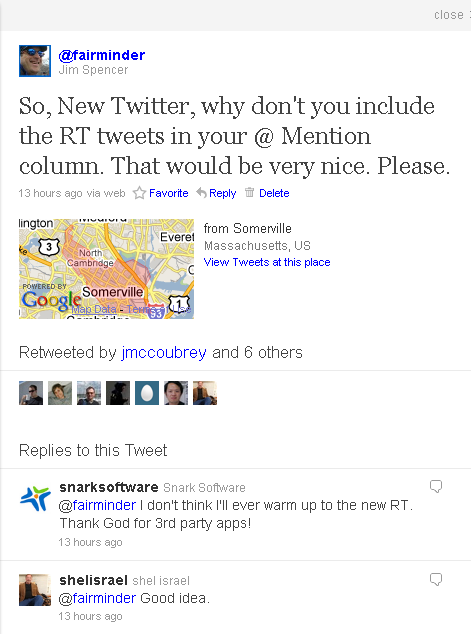 The user interface for twitter is new in September, 2010. A few initial reactions. It is missing the classic user generated RT messages on the @ Mentions tab. Allows you to scroll down the page forever. That is kind of fun. Is much wider. 1040 pixels wide now. Favorites: Now available in the sidebar of Home and in the main column of Profile. Is not intuitive and takes time and effort to learn how to use. I think that the new Retweets tab should automatically display Your Tweets, Retweeted, instead of everyone else’s. Wouldn’t it be grand if there were notifications of new DMs and @ Replies? What do you think of the new Twitter user interface? Late last night a few folks agreed with the cry for the missing RT in the @ Mentions tab. People want their RT recognized. Next post: When is the Best Time to Tweet?